Walt Disney World is a family friendly vacation destination that attracts millions of guests of all ages each and every year. While many families love to visit time and time again to make memories that will last a lifetime, plenty of other guests love to enjoy adult only trips that allow them to enjoy some experiences that might not be completely family friendly. Adult only trips allow guests to enjoy more thrilling attractions with height requirements, adult beverages throughout the Disney Parks, Disney Springs, and Disney Resorts, experiences such as Senses – A Disney Spa, and much more. One thing that many guests love to enjoy when they are in Walt Disney World without kids is an amazing meal in an upscale restaurant that is not always kid friendly. These signature dining locations offer up some of the best cuisine in all of Walt Disney World making them the perfect locations for guests to enjoy an adult only meal. 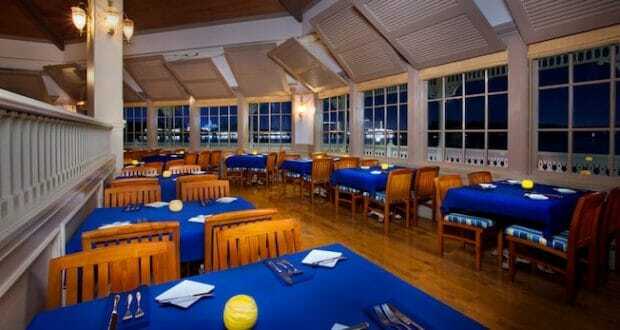 Here are the top ten Walt Disney World restaurants to enjoy without kids. One of the most opulent dining experiences in all of Walt Disney World that is for adults only can be found at Disney’s Grand Floridian Resort & Spa. Victoria & Albert’s is a signature dining experience that has received the AAA Five Diamond Award every year since 2000. Guests can enjoy a seven course meal and dessert in the location which is themed with Victorian décor and upscale details. Some of the courses offered at Victoria’s & Albert’s include Alaskan King Crab, Tagliatelle Pasta with Italian White Truffles, Wild Turbot, Roasted French Quail, and Australian Kobe-Style Beef which can all be deliciously paired with wines! Disney’s Contemporary Grill is home to one of the most popular restaurants in Walt Disney World thanks to its California inspired cuisine and stunning views. The California Grill is located at the top of the Disney Resort and features floor to ceiling windows that offer sweeping views of Seven Seas Lagoon, the Magic Kingdom, and the surrounding Disney Resorts. Guests who enjoy dinner at the location can enjoy beautiful views of Happily Ever After paired with menu options such as the Crispy California Roll, Roasted Tomato Soup, Sonoma Goat Cheese Ravioli, Grilled Circle Chicken Breast, Atlantic Yellowfin Tuna, Oak-Fired Filet of Beef, and Ora King Salmon. Another amazing location that guests will love to enjoy an adult only meal at focuses on coastal cuisine and amazing views. Narcoossee’s is found at Disney’s Grand Floridian Resort & Spa right on the shores of Seven Seas Lagoon and offers beautiful views of the Magic Kingdom and Cinderella Castle across the water. Guests who enjoy dinner at the location can order up options such as Maine Lobster Bisque, Shrimp and Crab Cake, Crispy Rhode Island Calamari, Pan-Seared Halibut, Black Angus New York Strip, and Grilled Grass Fed Filet Mignon. 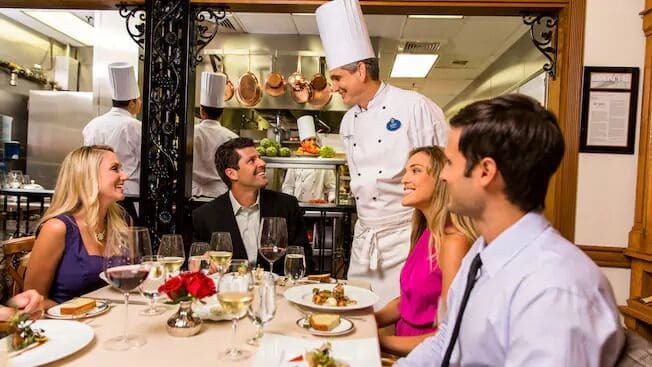 Guests who are looking to enjoy the ultimate steakhouse experience in Walt Disney World can head over to Disney’s Yacht Club where the elegance and charm of the ocean are brought to life through upscale nautical details. Yachtsman Steakhouse is themed to feel like a New England-style steakhouse and invites guests to dine on decadent menu choices such as Jumbo Shrimp Cocktail, 5-oz Wagyu Strip Loin, 14-oz Roast Prime Rib, 8-oz Black Angus Filet Mignon, and 1.5 lb Live Maine Lobster. With beautiful décor and unforgettable cuisine, Yachtsman Steakhouse is an amazing restaurant to enjoy in Walt Disney World. One restaurant in Epcot’s World Showcase is perfect for guests who are looking to enjoy a meal without children that will leave them feeling as though they have enjoyed a romantic evening in Paris. 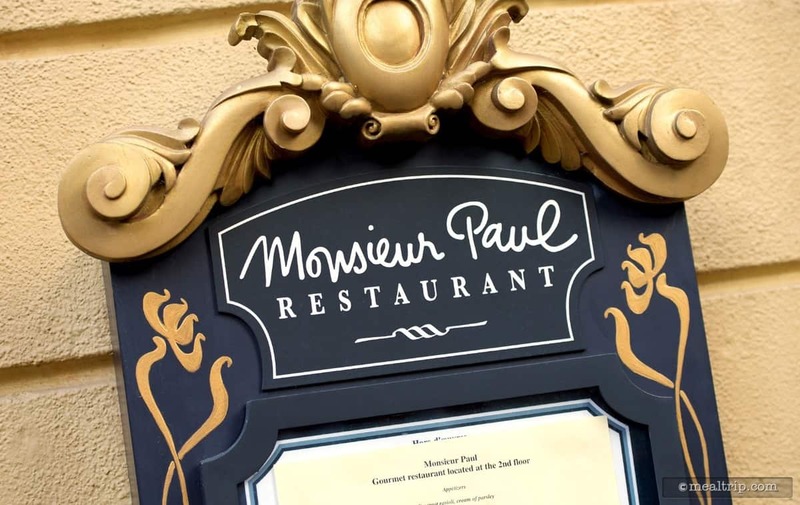 Monsieur Paul is located on the second floor of one of the buildings in the France Pavilion and invites guests in daily to enjoy classic French cuisine for dinner. Guests can opt to enjoy the Prix Fixe Menu or order as they go and dine on delicious options such as Soupe aux Truffles, Roasted Guinea Fowl Breast, Roasted Stuffed Sucking Pig Sliced, Black Sea Bass, Grilled Beef Tenderloin, and Veal Three-Ways. A relatively new full service dining experience in Disney’s Animal Kingdom invites guests to dine on international cuisine in an upscale environment that brings a spirit of adventure to life. Tiffin’s Restaurant is located on the bridge that connects Discovery Island and Pandora – The World of Avatar and serves up adventurous cuisine for lunch and dinner each day. Guests can choose from amazing menu options such as Charred Octopus, Asparagus-Leek Soup, Surf and Turf, Pomegranate-Lacquered Chicken, Crispy Sadza, Kamo Ramen, and Pan-Seared Alaskan Halibut. 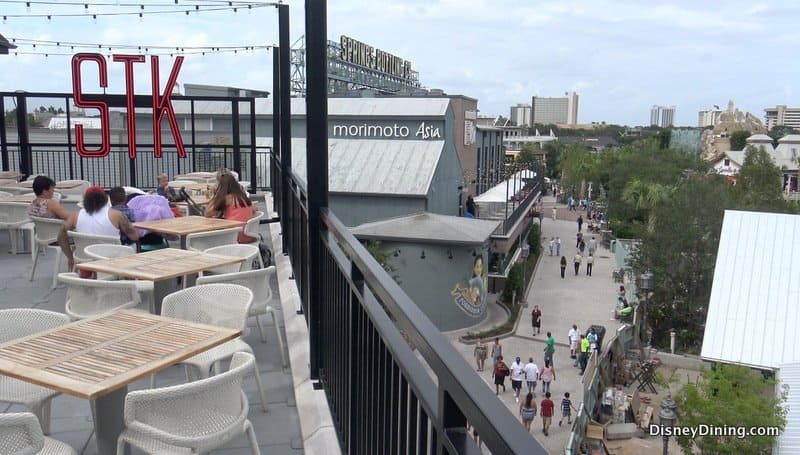 Disney Springs has seen an overhaul in the last several years that has brought in countless new shopping locations and popular dining options that guests can’t get enough of. A great dining option for an adult only meal is STK Orlando which brings classic steakhouse options to life with modern twists in a modern and chic setting. With an outdoor patio and live entertainment from a DJ, guests who enjoy lunch or dinner at STK Orlando can indulge in mouthwatering menu options such as Tuna Tartare, Mussels, Shrimp Cocktail, Alaskan King Crab, Filet 10 oz., Dry-Aged Bone-In Sirloin 18 oz., Dry-Aged Delmonico 14 oz., Seared Tuna, Scottish Salmon, and Smoked Maine Lobster & Grits. 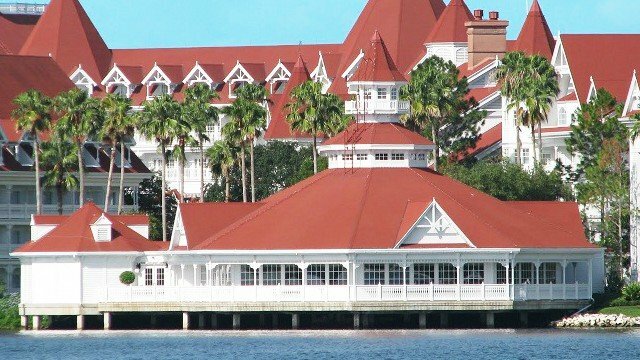 Adults who are looking to enjoy a kid free meal with innovative American cuisine infused with Mediterranean flavors can head to Disney’s Grand Floridian Resort & Spa. Citrico’s is a beautiful restaurant filled with Victorian charm and beautiful views of nearby gardens where guests can enjoy an extensive wine list and amazing cuisine. Open for dinner only each night, Citrico’s features menu options such as Pate de Campagne, Berkshire Pork Belly, Sweet Onion Bisque, Oak-Grilled Swordfish, Wild-Caught Halibut, Oak-Grilled Beef Filet, Scallop Risotto, and Red Wine-Braised Beef Short Ribs. Epcot’s World Showcase is also home to another wonderful dining location that is perfect for an adult only meal. Le Cellier Steakhouse invites guests to dine for lunch or dinner in an intimate space that is designed to feel like a cozy wine cellar with vaulted ceilings and warm lighting. Featuring traditional steakhouse options with some Canadian flavors, guests are sure to love every bite at this wonderful location. 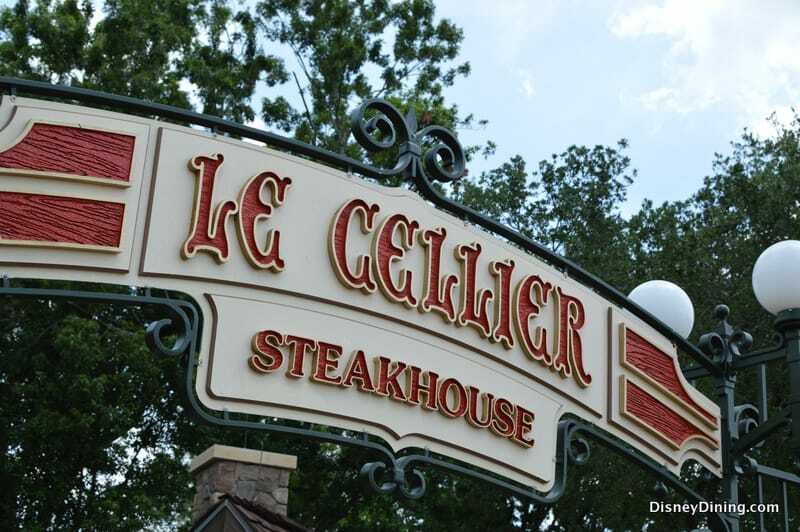 Some of the most popular menu options at Le Cellier Steakhouse include the Canadian Cheddar Cheese Soup, Le Cellier Filet Mignon, Black Angus Rib-Eye, USDA Prime New York Strip, Skuna Bay Canadian Salmon, Porterhouse Steak for Two, and Brown Buter-Basted George’ Bank Scallops. Disney’s Animal Kingdom Lodge is a wonderful place for adults to visit on a romantic night without the kids thanks to its grand atmosphere and beautiful savannah filled with gently grazing animals. Guests who visit the Disney Resort should enjoy dinner at Jiko – The Cooking Place for an amazing array of the flavors of Africa perfectly paired with an extensive list of South African wines. Some of the unique options offered at Jiko – The Cooking Place include Bains Whiskey-Infused Wwatermelon Salad, North African-Spiced Scallops, Elk Confit Flatbread, Chermoula Chicken, Durham Ranch Elk Lion, Sustainable Vulcan-Spiced Fish, Botswana Seswaa-Style Beef Short Ribs, and Snake River Farms Wagyu Strip Loin.